During the summer I train 3x per week in a 20 yard (= 18m) pool. I also occasionally swim in 25m and 50m pools, including during the winter. I am a surf life saver and periodically swim in the ocean. Pool: you manually set the pool length. An accelerometer within the device monitors your stroke and turns. Each turn increments the distance swum by the pool length. Provided the turns are correctly spotted then reasonable accuracy should be possible. Kick sets may not calculate correctly. Regularly changing stroke, stopping at the end of the lane, or dodging other swimmers in a crowded lane may also cause inaccuracies. Open water: distance is calculated from GPS readings. Based on the plot of an ocean swim below, I suspect that this is a lot less accurate. Note: aside from distance, heart rate measurements monitored by the watch at the wrist are not accurate or reliable in the water. I purchased the Series 3 Cellular 42mm on 15th November 2017. I used it for 10 weeks (until 28th January 2018) when it broke. During a walk I brushed it against a rock. Later in the day the screen fell out. My swim coach has a similar watch and has experienced 2 breakages requiring repair / replacement over the last year. Based on this I conclude that the watch is insufficiently rugged for people who lead active lives. Intuitive easy to use user interface. Integrates really well with other Apple devices and Apps. 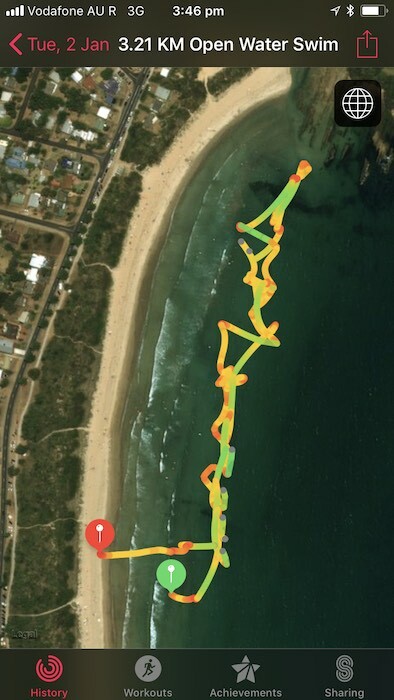 Great mapping of ocean swims. I purchased the Fenix 5X with Sapphire (toughened) screen on 14th October 2018. It cost 50% more than the Apple Watch so is clearly not directly comparable. To date (4th December) it has had plenty of pool swims but not yet in the ocean. It has survived a collision with lane ropes that I am not convinced that the Apple Watch would have done. During a steady time trial in an empty lane, 40 laps of a 50m pool (=2km) it measured as 3km. Interestingly, the miscalculation only started during the second km. 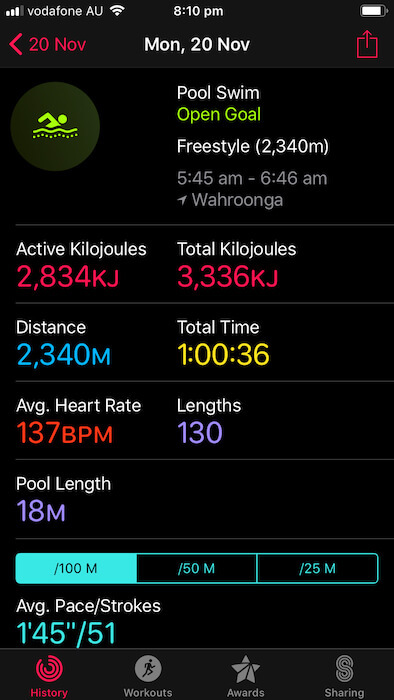 Whilst I don’t recall ever having confirmed the accuracy of my Apple Watch, it’s distances in the pool always seemed about correct relative to other benchmarks. 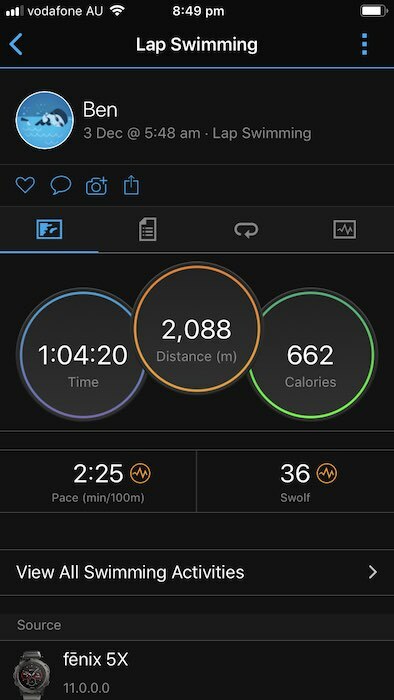 Despite updates to firmware (v11.0) and contact with the Garmin support forum I have not yet been able to fix the problem with inaccurate pool swim distance measurement. It is most likely that the movement of my left wrist during certain strokes is being interpreted incorrectly as a turn. Maybe if I changed my stroke or put the watch on the other wrist I might get a better result. Feels like the tail wagging the dog! I’ll keep experimenting – watch this space. Screen always on (don’t need to touch it to show time). Doesn’t require a brief water clearing procedure after swimming. Pool swim distance measurement is extremely inaccurate. Difficult to use because the user interface very basic and dated. Note: the Garmin can be linked to a wearable chest strap mounted heart rate monitor that takes accurate pulse readings whilst swimming. I have not trialled this. I loved the Apple Watch because it did lots of things really well. In many ways the Garmin feels like a backwards step, especially for its price. 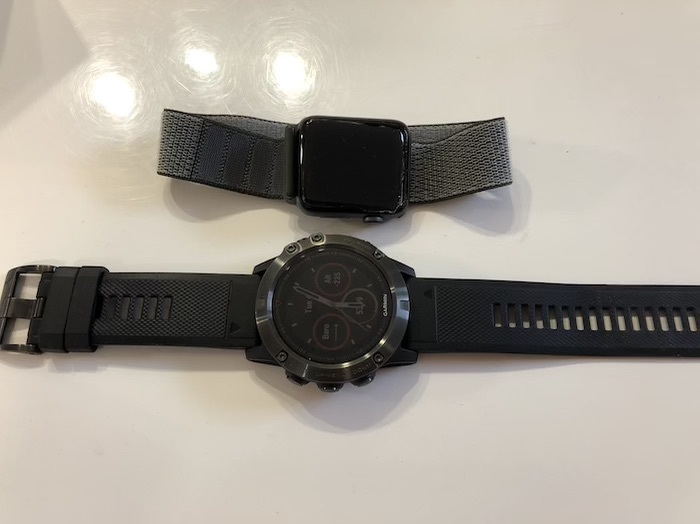 Both watches are quality devices and would suit many people for many uses. If you are swimmer, however, I don’t recommend you buy either to accurately monitor your swim training. I’m the coach to whom Ben referred. I am wearing my third Apple Series 3 watch in 12 months. The first one wouldn’t swipe either during or after a swim until it was perfectly dry. Apple replaced it at no cost. On to my second Apple Series 3!! I was on holiday in berlin and had a couple of workouts at their top swim centre. Not know for sure, I think the face of the watch clashed with a lane rope with the subsequent outcome: a cracked face. Shortly after the face popped off exposing the inners of the watch. On return to Oz, off to the Apple shop again. But, I had to wait for 2 weeks to get an appointment. Then it was another week to get the news that the watch needed to be replaced. On to my third Apple Series 3 (after spending an extra $99 to get it repaired on top of the $79 I paid for insurance. I should report them to the ACCC. However, the fine print in the insurance policy says I get two repairs providing I pay the extra $99 each time. I love the watch but I agree with Ben that it is not a robust product. I do understand that protective covers can be purchased online, however, the original product should deliver in all facets.